Damascus Countryside, SANA – Syrian Arab Army units have secured the exit of a number of families who had been taken as human shields by the terrorist organizations in Eastern Ghouta through the safe corridor at al-Wafideen Camp. SANA’s correspondent to al-Wafideen Camp said that scores of civilians, mostly women, children, and elderly people, on Tuesday morning arrived in al-Wafideen camp through the safe corridor after securing their exit by the units of the Syrian Arab Army. These civilians exited Ghouta in three batches. 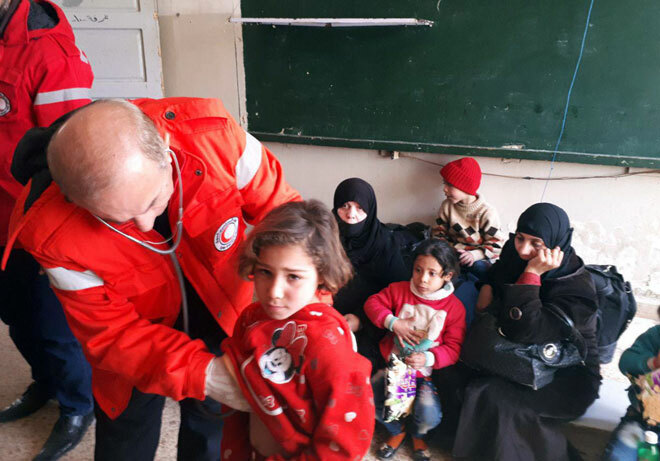 The reporter added that after being provided with first aid, the civilians were transported on board public transportation buses and ambulances to the makeshift housing centers which are prepared for receiving them. 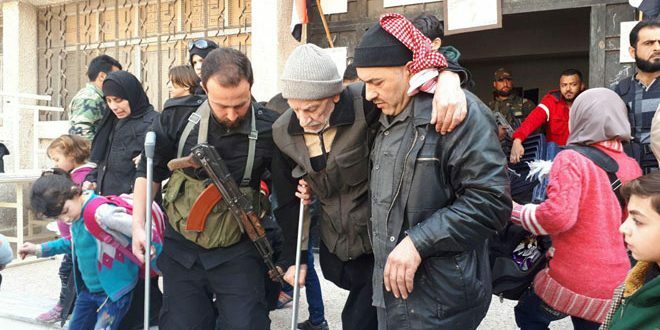 A number of locals expressed happiness to escape from the terrorist organizations which had been holding them hostage in Eastern Ghouta where they suffered from humiliation, hunger, and daily attacks by the terrorists. The locals who exited from Ghouta called the rest of the locals who are held by the terrorist organizations to stand against the terrorists and to go to the nearest post of the Syrian Arab Army or to the humanitarian corridors to save themselves and to protect their children. 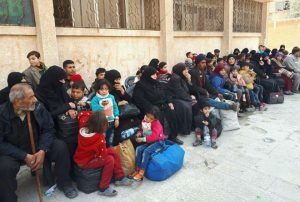 On Monday, the Syrian Arab Army managed to secure the exit of a number of families in Madyra area in Eastern Ghouta. The army also secured on Saturday the exit of a number of families who were detained by the terrorist organizations in Mesraba town. Next Russian General Staff: The US plans to exploit the terrorists’ provocations in Ghouta to accuse the Syrian Arab Army of using chemical weapons.